Hughton and his scouts are out and about! | NUFC Blog. Hughton and his scouts are out and about! Put the balls down, Chris! Now the season is over, you could be forgiven for thinking that manager Chris Hughton may be off for a holiday to recharge the batteries after guiding Newcastle through 46 games and, ultimately, to promotion. 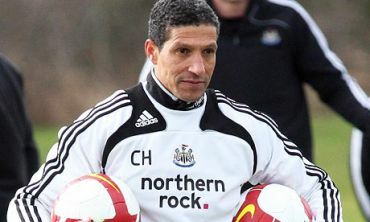 We all know that Hughton has demonstrated amazing professionalism and loyalty throughout the season, and that appears to have continued into the summer break as the quiet man has spurned the chance of a quick getaway with family in favour of travelling around football grounds throughout Europe searching for new talent that could help Newcastle survive in the Premier League next season. It makes sense really, and gives Hughton a chance to evaluate players for himself whilst they still play competitively in whichever respective league they are in. “It’s certainly an opportunity to look at players now we’re finished that little bit earlier. During the season you are able to get to games, but not as many as you’d like because of our midweek games,” Hughton said today. Perhaps I have read it wrong and Hughton is just going on a football holiday, or perhaps he follows some obscure European team? Either way, I would hope this points towards some exciting European talent possibly making their way to St James’ Park over the summer. We already know that Graham Carr has been buzzing around like a blue-arsed fly, which can only be a good thing. Now with the news that Hughton is going himself, we can assume that at the very least he has a few players that he is interested in, and he demonstrated with the signings of Routledge and Willaimson that he can spot a player. Perhaps the cheeky bid for Messi is on after all? That was a joke by the way! With every club out of 10 signings 2/3 will be great, 5/6 good/average, 2/3 not good enough. The more research is done, the better the chances that it will be the right player. In other words see the player first hand several times – and don’t rely on agents’ videotapes! CH has got off to a good start with players bought under pressure, now he has time to think about it properly I expect his success rate to improve further. Where I was in Bulgaria the food and drink was excellent toonsy mate. Wish I was there now. Yeah just watch what you say there Toonsy, may have to eat those words come next season ! Chuck – Eating what words??? Haha I’ll think about it Toonsy! Unless we loose some of our first premiership games, then we’ll need to get well rid! What, for our new womens team Stu? Wish I was in Bulgaria right now too, m8s. Nashville just underwent the worst flood in Tennessee history. Half of my hometown is underwater. Just got power back last night. That’s why I’ve been gone for the weekend. It’s some pretty devastating stuff. Thankfully me and the family was spared, but thousands of people are homeless and lost everything. Water 15 feet high in places. Never seen anything like it. 14 inches of rain in 2 hours and between TWO rivers. Yeah, it sucked. O’Hurley – Mate that’s awful. Hope everything sorts out asap mate. sorry to hear about that o’hurley,they reckon twenty odd people have been killed. the grand ole opry is under water also,it’s getting bad for extreme weather the states. Too bad O’Hurley. I’ve been following it on the news. Beautiful city full of very nice people (and good looking women). Was there a few years ago and had a great time. Sorry to hear about your tribulations, OHurley. Unfortunately, extreme weather will become the norm more and more in the future. jay jay – Just watched the Celtic v Rangers game. If that is the best 2 teams in Scotland then there if a fundamental problem. I understand it’s a derby game like, but they were still both pipe. Thanks lads!! I appreciate the support. Fortunately, me and my family is fine, but bloody hell- I feel for the people who lost everything. My girlfriend’s parents lost their house. I mean, in Nashville. We never get stuff like this. Scottish football is finished, 2 big teams is not enough, even Scottish Celtic and rangers supporters would prefer to play in the championship over the spl. Sorry to hear it ohurley i was in a similar position a few years ago though nothing as bad as 15 ft happend fortunately me and my family were ok.
iT’S GREAT TO SEE hughton is looking at players throughout europe. sirjasontoon been reading his David Icke material again with the old problem-reaction-solution. I am curious about the moon matrix, I have to admit. buzzin around like a blue arsed my fly, i been workin, workin all day for me mate. That’s why the media hate him. I reckon a team of half lizard players might be pretty good….bit slow in midfield though. If they had chameleon tendencies though, they could swap colors & get the ball from the other team without tackling. They could maybe employ an Escher formation too? What’s your opinion about lady gaga then?? ?Is she really one??? i can just see that divvy bint taking ower the world. Totally ga ga, or is that gar gar? O’Hurley – sorry to hear about the floods. I used to live in a town in Cumbria that suffered the same fate not long ago. The only silver lining is the long-term impact on the community, which so far has been good. Amazing what it does when people have to rally round and look after each other. And look on the bright side: at least YOUR town isn’t called Cockermouth. SJT, someone else who knows about HAARP, I am impressed. Do you get Nexus Mag. Some of the stuff in it is really frightening. I went to a David Icke talk, he aint the loony people think he is although some of his stuff needs a large pinch of salt. Hurley a belated commiserations to your Towns problems, I hope you don’t have the same type of greedy developers and politicians as we have, who are building property on flood prone areas. I’ll make football related comments later. they’ve got far worse ones than us mate, he’s in america. OHurley, sorry to hear of your town’s high water troubles. Nashville used to be flooded regularly until the TVA came along with their dam projects in FDR days. It worked well, as when floods came in, the reservoirs could hold the excess. Now many of the pools behind the dams are silted up, so the capacity for storage is reduced, and the demand for hydro-electric power means the water is regulated for energy generation, not flood protection. The silting problem is most obvious in the mid-West USA where nearly all the flood control has been lost as poor farming technique have resulted in eroded soil ending up filling in behind dams. Mother Nature is a bitcj O’Hurley , I know its not on the same levels of what your going through ( not in the slightest ) but due to fly out of ireland friday for my stag weekend and dunni if ill be going as of yet! Good to see the rags are keeping out of mischief! Here’s the Mail and lo, it appears we’re looking at another ‘keeper! Just how many dp they think we need or more to the point, keep happy? Perhaps the Mail thinks we’re trying to top Man Citeh’s nine? Ho hum and O’Hurley, keep smilin’ eh, it could be worse….. you could have been a Sunderland supporter too!!! Soh! enough aboot the weather, you Brits just love to talk about “the weather”, Yo O`Hurley, yeah I know it`s rough man, but please dont bring weather into the picture it`s wose than accounting and and Ashley. Now on another note I read where we are looking at a youngster who scored 20 goals in 38 games for Reading with the unlikely name of Gelfi Sigurdsson. On another note there`s a few players at Pompey who cold help this side, namely O`Hara,Belhadj, Kevin-Prince Boateng, not often you get the chance to sign a prince! Hopefully our Blue Assed fly Scouts have not ignored Citeh, who I believe are about to have a clearout, rumored Irelands on his way, one of the best playmaker`s in the league ,plus gets his goals. Could you imagine a midfield wth both Ireland as the playmaker and O`Hara as the engine room, mmm mmm! Belhadge or young Coleman from Everton @ RB, see some football played there and that`s what we want entertaining football, in it ? Ohurley,sorry to hear of ur terrible misfortune,i hope all will be ok soon. I most certainly will visit again for the next fresh important topic..